Lilongwe – The terror and fear were real, the damage devastating—the response swift and effective. 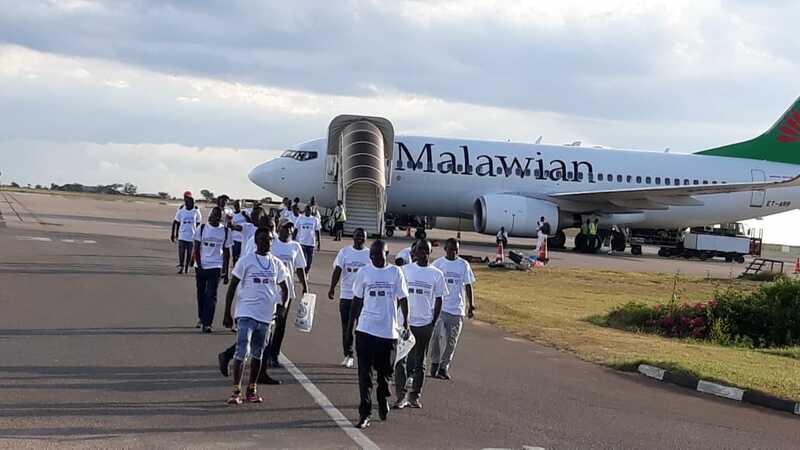 Over three days last week, South Africa-based staff from the International Organization for Migration (IOM), in collaboration with the Governments of Malawi and South Africa, assisted 57 Malawian nationals with voluntary return to their homes, following an outbreak of violence in the Durban area of KwaZulu-Natal. Support for these vulnerable migrants was provided under a project funded by the European Union (EU) called “Pilot Action on Voluntary Return and Sustainable Community-Based Reintegration.”  According to press reports and several human rights NGOs, migrants of other nationalities—notably Congolese, Burundians and Tanzanians—also were targeted by xenophobic mobs, suffering injury, theft and damage to their property. 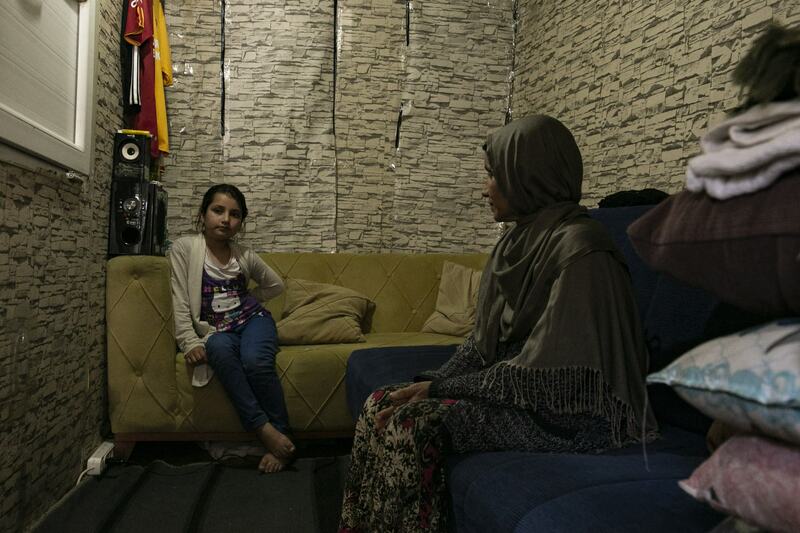 Ankara – As the world’s largest migrant and refugee-hosting country, Turkey hosts over four million migrants, seeking a different life from the instability, uncertainty and poverty they have left behind. Many struggle to integrate due to legal, financial, and language barriers, or lack of support. There comes a time when they realise they cannot continue to stay in Turkey and that going home is the best option. Today (16/04), IOM Turkey and the EU Delegation in partnership with the Government of Turkey, launched a new phase of a project that provides assistance to migrants living in Turkey who opt to return to their country of origin. The Assisted Voluntary Return and Reintegration (AVRR) of Irregular Migrants in Turkey project helps migrants get home and settled in a safe and dignified way. 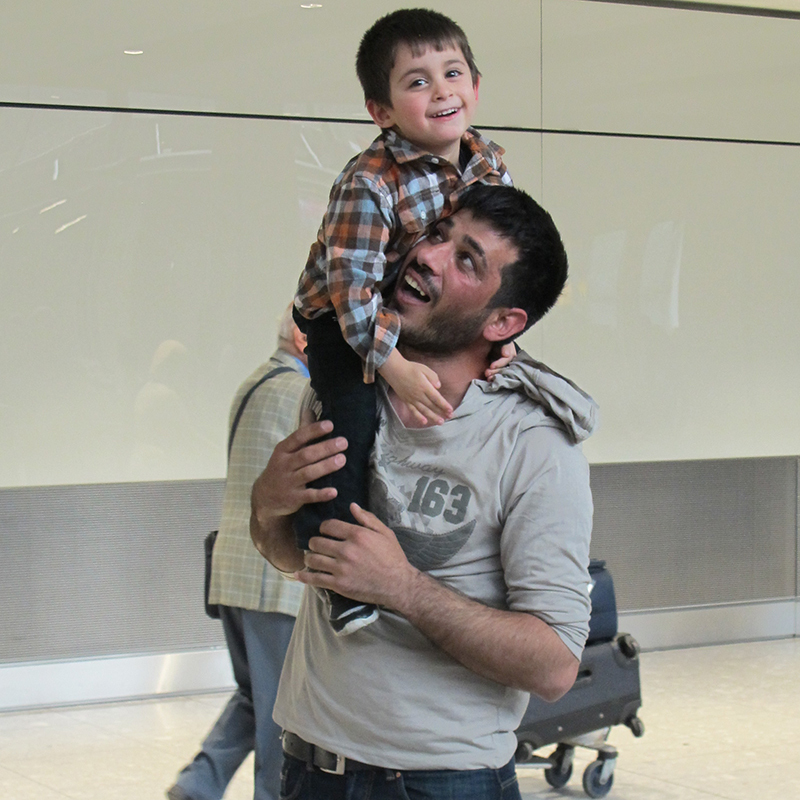 This was true for Zarghona Balkhi and her young daughter Raihan who IOM helped return from Turkey to Afghanistan. 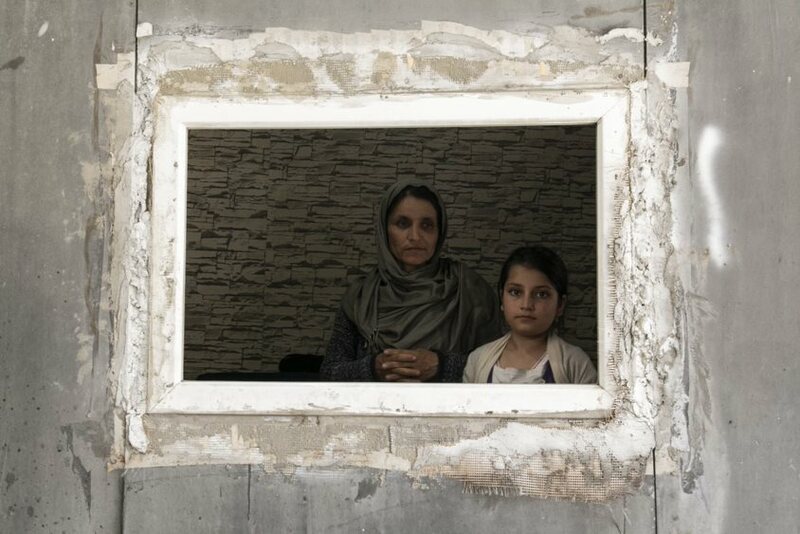 After a two-week ordeal organized by smugglers crossing Afghanistan, Pakistan, the Islamic Republic of Iran, and Turkey, they arrived in Istanbul with Zarghona’s son (Raihan’s older brother) who later disappeared just weeks later. “I tried to find work here but without speaking Turkish and not having an education, it is too difficult for me. My son was my only livelihood and without him it is impossible to stay,” said Zarghona. With IOM assistance, Zarghona and Raihan returned to their home city of Mazar-i-Sharif and were reunited with their family. “Safe options for migrants to return home are crucial, without the stigma of deportation. AVRR assistance brings a complementary option for stranded or vulnerable migrants to return home in dignity and safety with the opportunity to reintegrate sustainably in their home communities,” says Lado Gvilava, IOM Turkey’s Chief of Mission. Through the programme, migrants can make an informed decision and take ownership of the voluntary return process. 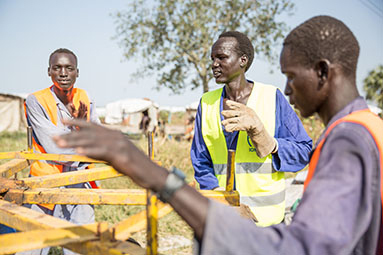 In addition, through IOM’s vast network of offices worldwide, returnees can receive tailored support to overcome challenges relating to their reintegration or address specific vulnerabilities that they face. The new phase of the project will be implemented together with the Turkish Ministry of Interior, the Directorate General of Migration Management (DGMM), and the Central Financing and Contracting Unit (CFCU) and will aim to assist a minimum of 3,500 migrants to be provided with assistance, with approximately 20 per cent of the most vulnerable to be provided with reintegration support. IOM will also implement a series of capacity-building activities and study visits, with to support DGMM’s efforts to strengthen the national AVRR mechanism in line with national and international standards. IOM has a long history and extensive experience implementing AVRR programmes since 1979, running projects in all regions of the world. In 2015, IOM assisted 69,540 migrants to return (the highest level for the past 15 years) from 97 host/transit countries to 156 countries of origin. In Turkey specifically, IOM has helped 8,098 stranded migrants with assisted voluntary return and 438 with reintegration assistance from 2009–2018. Working alongside government partners, IOM AVRR programming is guided by the principles of voluntariness, migrant-centred response, safety, sustainability of reintegration, confidentiality, and evidence-informed programming. Sana’a – With more than 3.6 million people displaced, a crumbling economy and an overstretched health care system, the humanitarian crisis in Yemen continues to get worse. 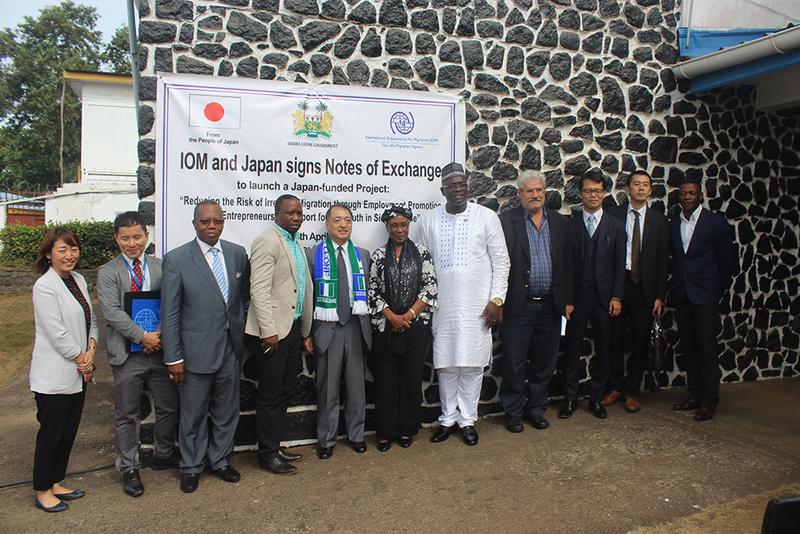 To support communities affected by the conflict, the Government of Japan has contributed USD 2,500,000 to the International Organization for Migration (IOM) to reach over 100,000 people through emergency health services. As the conflict enters its fifth year, just over 51 per cent of health facilities in Yemen are fully functional and approximately 19.7 million people are in need of health care. Even during peacetime, most public health facilities were strained. Today, lack of financial resources, doctors, medicine and medical equipment has caused further deterioration and the increased number of people seeking medical assistance has overwhelmed medical facilities. 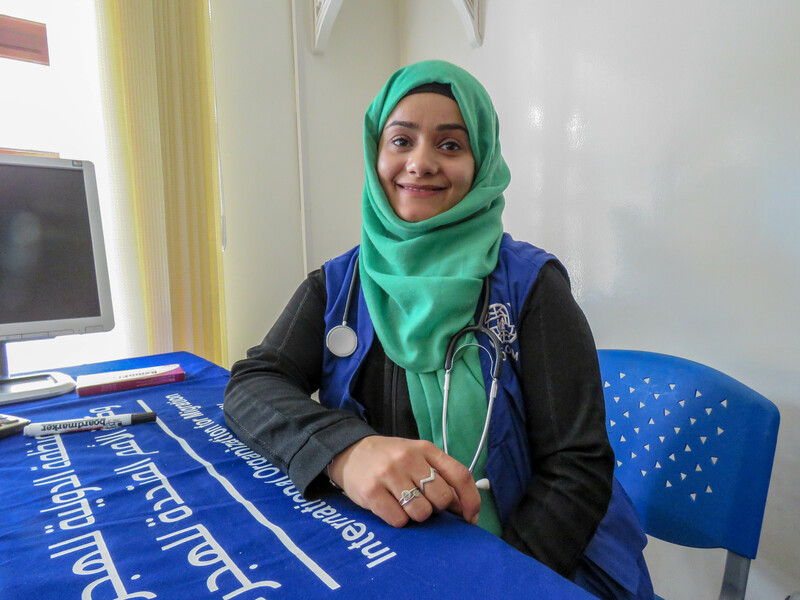 With Japan’s contribution, IOM will ensure lifesaving and basic health services in two hospitals and four health care centres across five governorates: Al Mahwit, Sa’ada, Hajjah, Taizz and Shabwah. Through this project, IOM will improve access to a full package of primary health services, as well as referrals to emergency secondary and tertiary level care, for the most vulnerable communities in remote locations. “This contribution from the Government of Japan is coming at a vital time for the people of Yemen, as they are facing increased numbers of cholera cases,” said David Derthick, IOM Yemen Chief of Mission. “The country’s health care system is almost at breaking point, while health needs continue to grow. As humanitarians, it is our duty to alleviate this immense suffering to whatever extent possible. These funds will support our health assistance in some of the hardest to reach areas in Yemen,” he added. The Government of Japan and IOM have a long history of partnership in responding to humanitarian crises around the world. 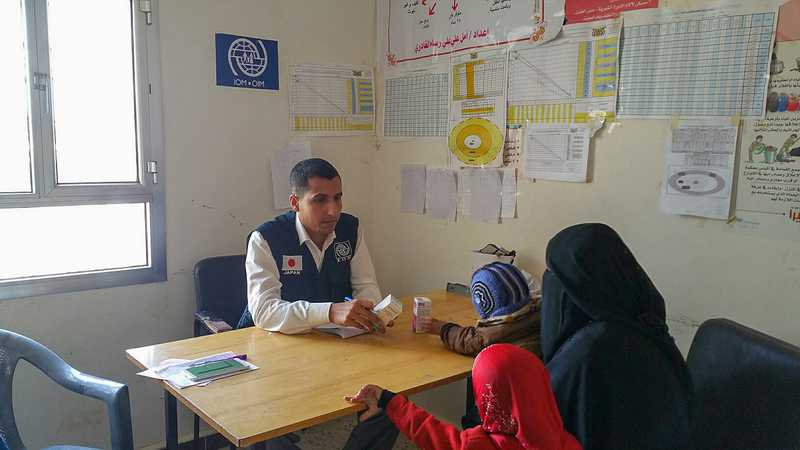 In 2016, IOM implemented a large-scale Government of Japan funded project centred on providing humanitarian assistance to displaced and conflict-affected Yemenis in the areas of water, sanitation and hygiene (WASH) and health care. IOM provides health care to people in Yemen through mobile responses and by supporting public health facilities across several governorates. 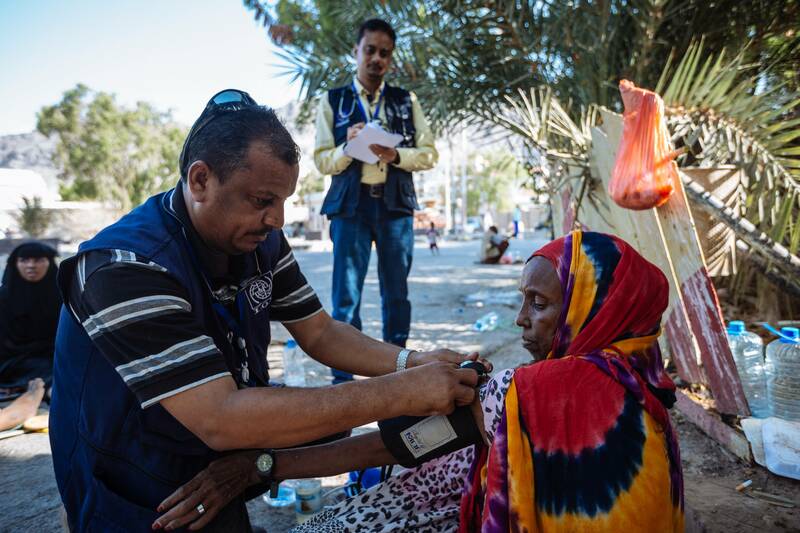 In 2018, the Organization conducted 688,279 medical consultations for displaced people, conflict-affected communities and migrants. 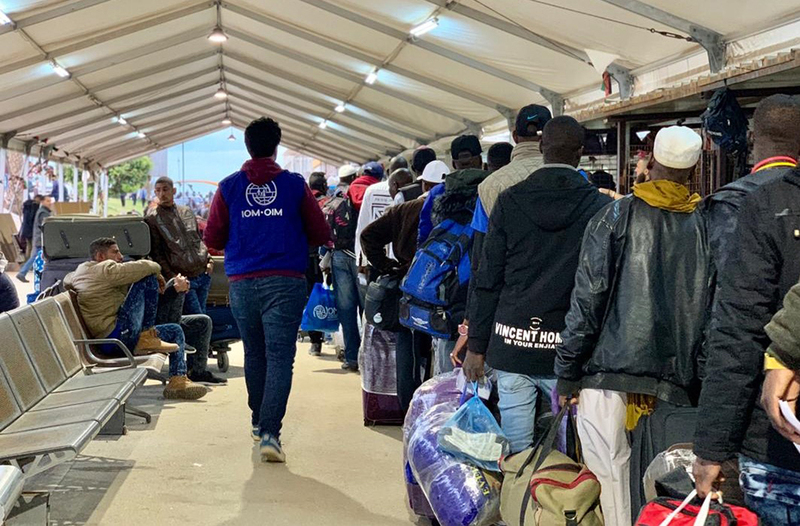 Tripoli – The International Organization for Migration (IOM) continues to provide Voluntary Humanitarian Return (VHR) assistance to migrants stranded in Libya and wishing to return home, despite the backdrop of continuing armed conflict in in Tripoli and the challenging conditions on the ground. Harare – Post-cyclone emergency response operations in Zimbabwe this week were boosted by USD 200,000 in contributions from the Government of Japan and the International Organization for Migration's own internal funding mechanisms. The assistance will go towards Shelter and Non-Food Items (NFI), Camp Coordination and Camp Management (CCCM), Health, Protection, Displacement Tracking, Mental Health and Psychosocial Support (MHPSS) and Early Recovery. IOM will take the lead in the Shelter and NFI/CCCM cluster. The flooding caused by Cyclone Idai has so far left 268 people dead. Some 270,000 were affected with an estimated 21,000 displaced in the country’s eastern Chipinge and Chimanimani districts. The affected persons who are now residing in collective centres such as schools, hotel conference rooms and vacant shops are in urgent need of assistance. Following the aftermath of the cyclone, IOM this month brought a high-level delegation to the hardest hit areas of Zimbabwe. The delegation – IOM Regional Director Southern Africa Charles Kwenin, IOM Zimbabwe Chief of Mission Mario Lito Malanca, and IOM Director of Operations and Emergencies Mohammed Abdiker – met with government officials and affected people in Chimanimani and Chipinge districts to establish the needs and challenges faced by the communities affected by Cyclone Idai. In a visit to Kopa and Ngangu, two communities of Chimanimani where the most displacements took place, the IOM delegation noted that Kopa, a once flourishing growth point with more than 77 households, was reduced to rubble with surviving residents seeking shelter in surrounding households. To date 305 people remain missing. 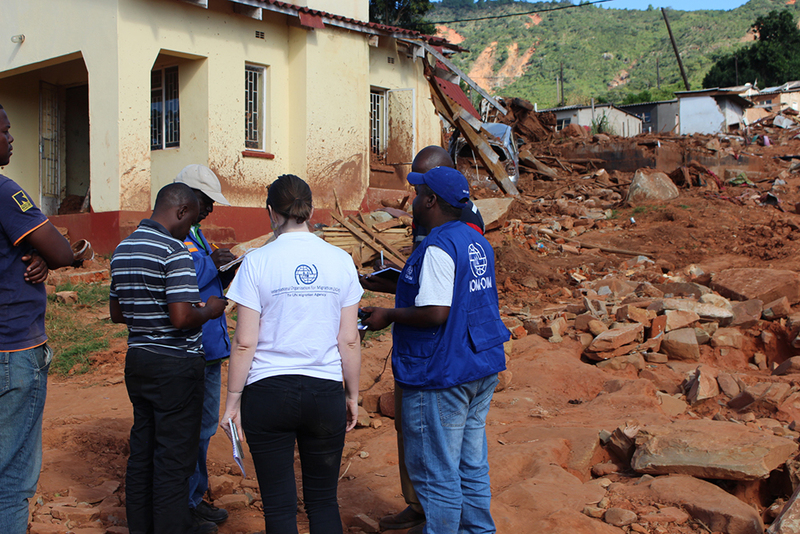 Upon seeing the level of destruction caused by the cyclone, the Director of Operations and Emergencies authorised USD 100,000 from IOM’s internal emergency mechanism to Zimbabwe to cater for shelter and NFIs. “At IOM, we are looking at best ways to assist the affected communities especially in terms of shelter, psychosocial support and non-food items. We are here to support the people of Zimbabwe in the best way that we can,” said Abdiker. The Ministry of Foreign Affairs of Japan also responded to the IOM appeal and supported the mission with USD 100,000 to alleviate the situation of Cyclone Idai affected communities. The Japanese funding will support IOM’s work in Shelter/NFI and activities. 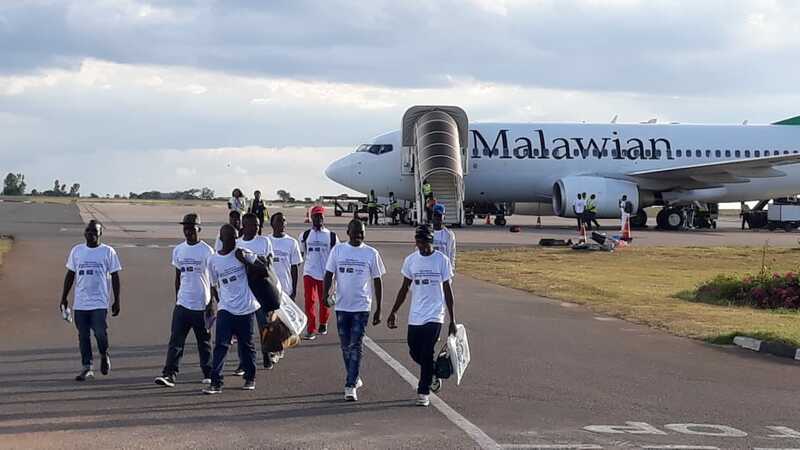 Lilongwe – The International Organization for Migration (IOM) has appealed for USD 3.15 million from the international community to enable the Organization to provide multi-sectorial humanitarian assistance to those affected by Cyclone Idai in Malawi. When Cyclone Idai made landfall in Malawi on 14-15 March 2019, it brought heavy and persistent rains which led to severe flooding across country’s southern districts. According to the Government of Malawi figures, more than 869,900 people have been affected, including more than 86,980 displaced, with 60 deaths and 672 injuries recorded. In total, fifteen districts in southern Malawi have been impacted. 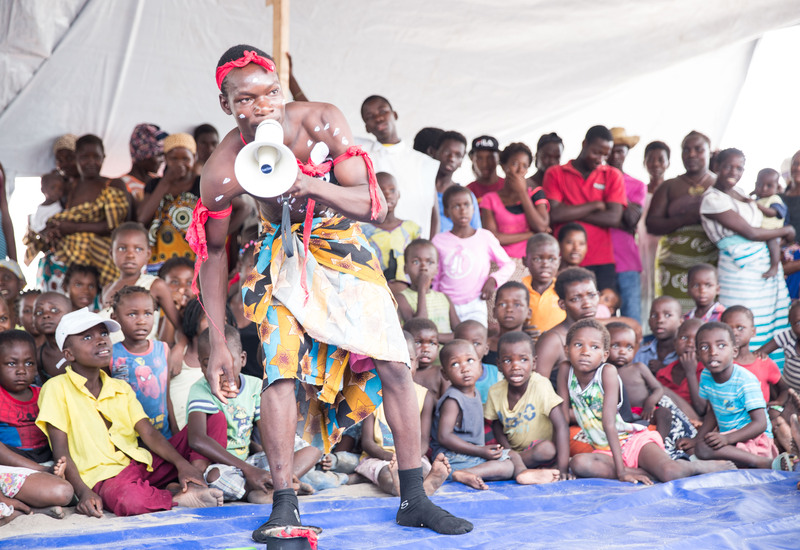 The site assessments conducted by IOM’s Displacement Tracking Matrix (DTM) team in the four districts with the highest displacements – Zomba, Nsanje, Chikwawa, and Phalombe – from 25 March to 6 April 2019, recorded that 110,110 individuals (24,887 households) were displaced throughout 103 sites. Almost all displacement sites are collective centres, where populations fled to existing structures such as churches or schools and are sheltering in and around these buildings. 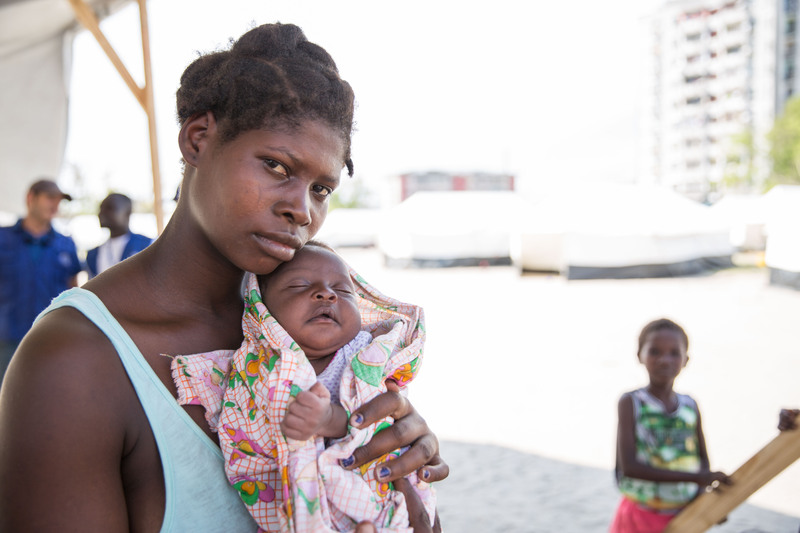 However, living conditions are quickly deteriorating, due to overcrowding and the lack of access to basic services. With agriculture being the main source of livelihood for the rural population in Malawi, the heavy rains and floods have impacted agricultural activities. As fields are inundated, recently planted corps have been destroyed. Some districts as Nsanje are already reporting food insecurity. According to DTM assessments, the primary need for displaced people is food, followed by shelter. Displaced people report the desire to return home as soon as the rains cease. However, their homes have been destroyed and they do not currently have the means to rebuild them. Until they are able to return home and re-cultivate their crops, the displaced population will be reliant on humanitarian assistance and forced to live in collective centres and spontaneous sites and endure substandard living conditions. According to the DTM site assessment, half of collective centres are located in schools meaning that learners are unable to continue their education and displaced communities living in schools are able to relocate to another location. Find the full Malawi appeal here. 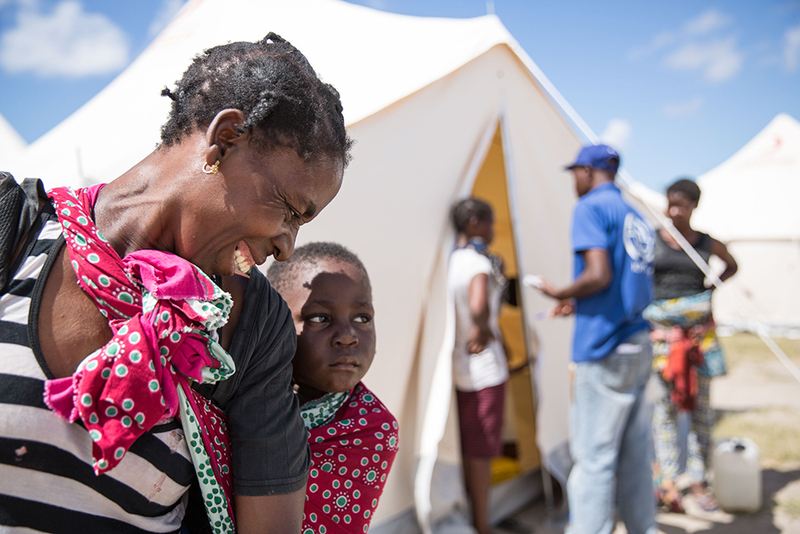 Beira – Hundreds of displaced Mozambicans affected by Cyclone Idai voluntarily moved to a new temporary displacement site in Beira this week with the assistance of the International Organization for Migration or were provided with shelter kits that allowed them to return home. A total of 143 families (424 individuals) were moved in an orderly fashion on Wednesday from two schools that are scheduled to reopen to Samora Machel, a temporary displacement site. IOM and INGC established the temporary site in collaboration with other humanitarian partners including the British and Spanish Red Cross who provided the WASH facilities, and youth volunteers who set up tents. Following the recent Ministry of Education directive to resume school across cyclone-affected areas, IOM offered support to the Government of Mozambique through INGC to assist in the voluntary and dignified movement of people. “IOM is committed to responding to immediate humanitarian needs in cooperation with the Government of Mozambique, and supporting efforts to facilitate voluntary, dignified, sustainable returns. IOM is also committed to support INGC in maintaining temporary relocation sites until the affected population are able to return,” said IOM Mozambique Chief of Mission Katarina Schnoering. The CCCM Working Group, a Task Force on relocation/movement was created to help the the government in these activities. During this movement, Task Force members ensured that those who move are well informed before, during and after the movement. Also on Wednesday in Beira, some 350 families who had been recently moved from Matadoro secondary school into the temporary relocation site in San Pedro Parish, returned to their homes after receiving assistance, including shelter kits from IOM, food packs from WFP, and hygiene items from UNICEF, in coordination with the shelter, WASH and food clusters. Through its shelter support package and CCCM support for return movement, IOM aims to support people to return to normalcy as quickly as possible. 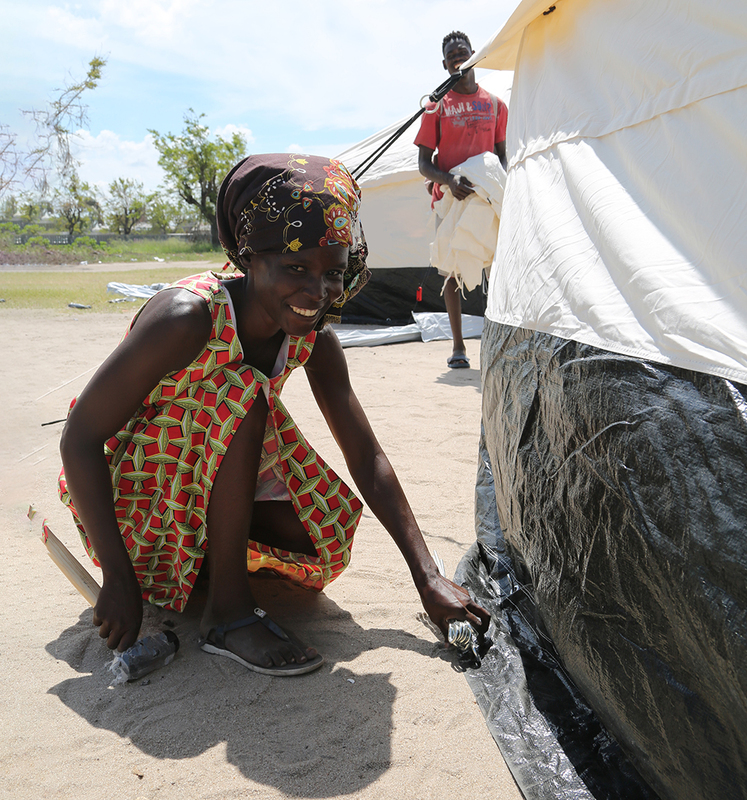 In the first week of April, IOM Displacement Tracking Matrix (DTM) teams in coordination with Mozambique’s INGC conducted a rapid assessment in 41 displacement sites in Beira, Nhamatanda, and Dondo Districts, to produce the “IOM DTM Site Assessment Round 2 – Cyclone Idai” (10 April 2019). The assessment aims to provide information for humanitarian partners including demographics, needs, and vulnerabilities for each site. Over 52,000 individuals were identified in the displacement sites; 22 of the displacement sites are schools and 7 are community centres. The assessment indicates that primary needs of the displaced people in these camps are food, shelter, and latrines; secondary needs include clothing and blankets. Site Profiles showing specific demographics, needs, and vulnerabilities for each site. 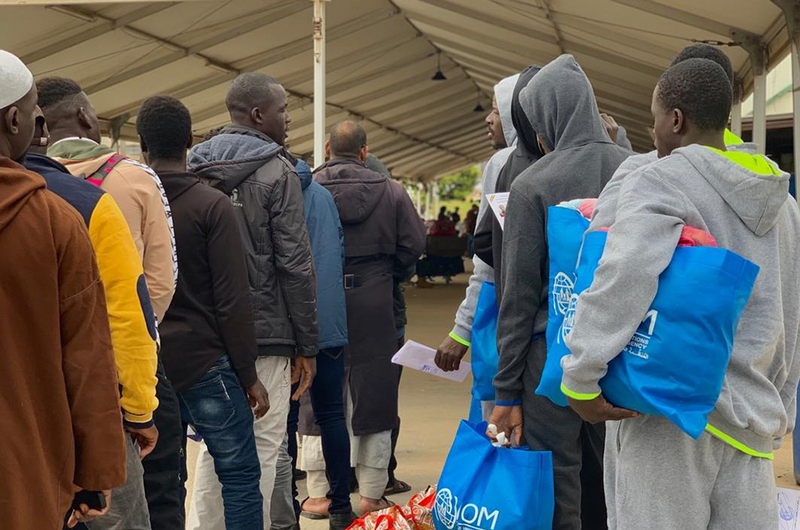 IOM joined the United Nations Refugee Agency (UNHCR) and UNICEF to express serious concern over the situation of the 62 migrants and refugees rescued on 3 April by the Alan Kurdi, a vessel operated by NGO Sea Eye. Those individuals by late Thursday had still not been guaranteed a safe port for disembarkation. According to IOM Rome’s Flavio Di Giacomo, in the last three days two women had been disembarked from the ship – which is currently off the coast of Malta – including one who is pregnant and who reportedly suffered an epileptic fit on Thursday. Her husband apparently remans on board. Weather conditions and the many days spent at sea are making the situation difficult for those on board. Further, all the migrants and refugees who departed from Libya already have experienced being victims of serious human rights violations. IOM Greece Veatriki Aravani reported on Thursday (12/04) that since last Friday, the Hellenic Coast Guard (HCG) performed at least three incidents requiring search and rescue operation off the islands of Chios and Lesvos. The HCG rescued a total of 96 migrants and transferred them to those respective ports. Those arrivals were among some 175 IOM recorded in the days between 04 and 09 April arriving at the islands of Lesvos, Samos and Oinouses and bringing to 5,796 the total number of sea arrivals to Greece this year. (see chart below). 2019 is the sixth year of IOM’s efforts to systematically record deaths on migration routes worldwide through its Missing Migrants Project (MMP). Since the beginning of 2014, the Project has recorded the deaths of 31,690 people, including 731 in 2019. Due to the challenges of collecting information about these people and the contexts of their deaths, the true number of fatalities during migration is likely much higher. Therefore, MMP records should only be viewed as indicative, rather than representative across time or geography. The waters of the Aegean Sea became the site of a tragic loss of life over the past weekend, when an 8-year-old Syrian child was found dead in the boat in which he was travelling with 41 other people to the Greek island of Lesvos from Dikili, in Turkey’s Izmir province. At least 15 people have lost their lives trying to reach Greece by sea in 2019, including seven children. Several deaths were recorded on the US-Mexico border over the past few days. On 5 April, a man died in a vehicle accident in Laredo, Texas. He was found with fatal injuries after the van in which he was travelling with 11 others crashed while fleeing US Border Patrol agents in Highway 83. A similar incident cost the lives of two people the following day (06/04), when a van carrying 11 migrants overturned near mile marker 131 on New Mexico’s State Road 9 after a high-speed chase by USBP agents. Two people died in that crash, while nine were injured. The unpredictable currents of the Río Bravo cost the life of a 30-year-old man who attempted the crossing from Nuevo Laredo, Tamaulipas to Texas. His remains were found on 5 April by Mexican civil protection authorities. Additionally, a man drowned in Briar Canal, around seven miles east of the Calexico Port of Entry in Imperial County, California. He was travelling with his brother, who alerted local authorities. Tragically, he was unresponsive when he was rescued from the canal and was pronounced dead on 8 April. In Mexico, a 15-year-old Guatemalan teen fell from the freight train in which he was travelling north to the US and was killed near the municipality of Nopala de Villagrán, Hidalgo on 7 April. In the first three months of 2019, the Missing Migrants Project has recorded the deaths of 190 people during migration in the Americas. Antalya – A country surrounded by regional conflict and mass displacement, Turkey houses four million refugees and migrants. This produces countless challenges, not least among them huge increases in human trafficking. Turkey has seen a rise in the number of victims of trafficking from Syria, with the massive influx of migrants from there in recent years. Syrian victims are typically forced into labour and begging. Cases of child marriage, early marriage and forced marriage are also common, due to vulnerable conditions and shortage of livelihood opportunities faced by migrants. 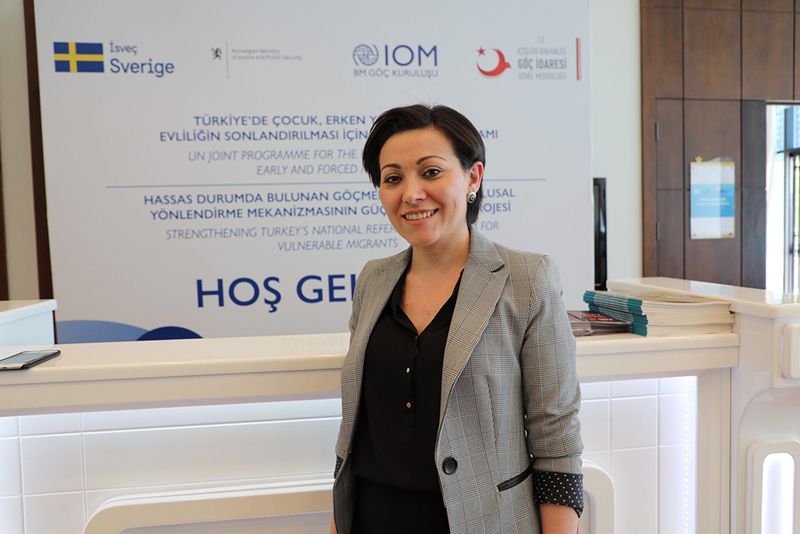 Human trafficking, and related phenomena, are among the top issues IOM is working on with Turkey’s Directorate General for Migration Management (DGMM), established six years ago Thursday (11/04). 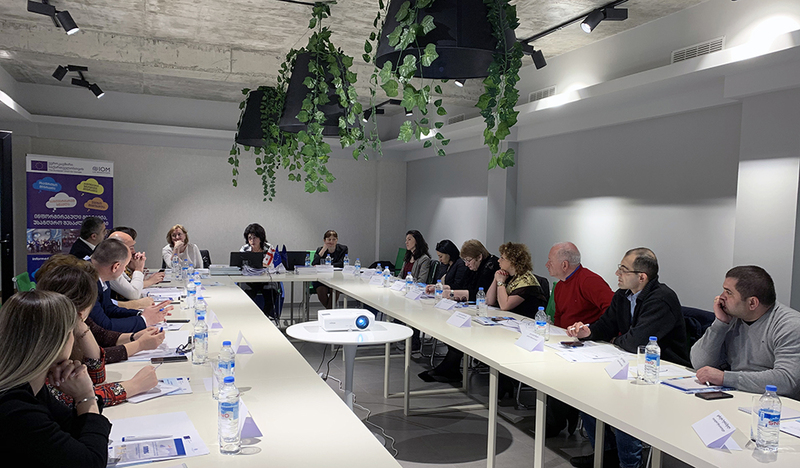 For this week’s anniversary, experts from across Turkey gathered in the southern city of Antalya for seminars on how to more effectively identify victims of trafficking and assist them in line with international anti-human trafficking protocols and procedures. These sessions were supported by IOM and the governments of Norway and Sweden. “It is very important for us to prevent any type of exploitation, especially human trafficking, with a focus on women and girls. We have rapidly developed our capacity over the six years since we were founded to help victims of trafficking and punish criminals,” said Abdullah Ayaz, Director General of DGMM. Overall, DGMM reports that trafficking in Turkey is predominantly for purposes of sexual exploitation with victims mainly coming from the former Soviet Union and Eastern Bloc countries. To date, IOM has offered more than 1,400 victims a range of support including shelter, psychosocial support, and assisted voluntary return and reintegration. Read more here. One of the training sessions focused on examining case studies of human trafficking and sexual abuse. Another session covered linkages and differences between human trafficking and child marriage, early marriage and forced marriage. “Turkey has opened its doors to migrants and refugees escaping conflict in their home countries, while others come lured by traffickers with the promise of a better life. Our strong working partnership with DGMM is paramount in the fight to prevent trafficking and provide protection to victims, ensuring they receive the support they need to recover and restore their dignity,” said Lado Gvilava, IOM Turkey Chief of Mission. The Government of Turkey provides a range of help and services to the victims of trafficking, including residence permits, free health services, legal support, and providing accommodation at migration centres. In 2017, DGMM reported that 303 victims received assistance. IOM has worked in partnership with government since 2004 to prevent trafficking and develop effective counter-trafficking responses. These include implementing activities to raise awareness among vulnerable migrants, as well as with law enforcement officials, judges, prosecutors and other authorities. 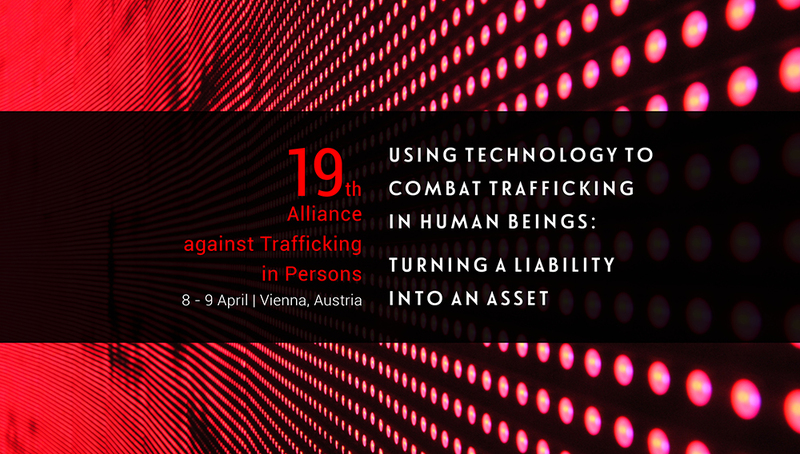 Technical cooperation between IOM, government and civil society partners aims to strengthen counter-trafficking legislation, policies, and procedures. Juba – Seven months after the signing of the revitalized peace agreement in South Sudan, some communities uprooted from their homes are on the verge of going home. The International Organization for Migration (IOM) embraces this prospect of stability in the world’s youngest country and is scaling up its response to returnees across the country. Multiple years of conflict in South Sudan have displaced nearly two million within the country. Approximately 180,000 IDPs have found refuge on six UN bases, called Protection of Civilian (PoC) sites, where humanitarian agencies, like IOM, offer relief. Besides surveying IDPs, IOM also monitors mobility trends through its Displacement Tracking Matrix (DTM). In its latest round of mobility tracking – covering 87 per cent of the country and reaching 1.2 million IDPs – DTM  identified over 860,000 returnees, of whom a third returned last year. Clashes and displacement continue throughout the country, so for many displaced communities safe and sustainable return is not yet an option. IOM’s DTM found that 20 per cent of people currently displaced were forced to flee in the last year, mainly by conflict and communal clashes. One example: Wau County. Relative stability reigns in Wau Town, which has enabled increased returns. In surrounding areas such as Baggari, Beselia and Kuarjena, ongoing violence has triggered new influxes of IDPs to PoC sites and collective centres. Implemented since 2015, the project allows refugees to substantially improve their livelihoods and help host populations by establishing mechanisms to prevent and manage conflicts of scarce resources. In total, around 20,000 refugees – and 35,000 members of the host population – have benefited from support for income-generating activities, access to water, support for family rearing and inter-community dialogue, through this project. "Our understanding of proven approaches would allow us to have an impact in our way of serving and assisting populations in need in Mbera, in the Hodh el Chargui, and beyond," stressed the Ambassador of the United States of America to Mauritania, Mr. Michael Dodman. "The constant support provided by the United States of America through PRM demonstrates its understanding of the vital needs of refugees and host populations in the Hodh Chargui, who today need more than ever to improve their livelihoods and prevent conflict over natural resources. I take this opportunity to launch a call for contributions from donors to fill the important gaps in the livelihoods sector in and outside the M'bera refugee camp," said Laura Lungarotti, IOM Mauritania Chief of Mission. 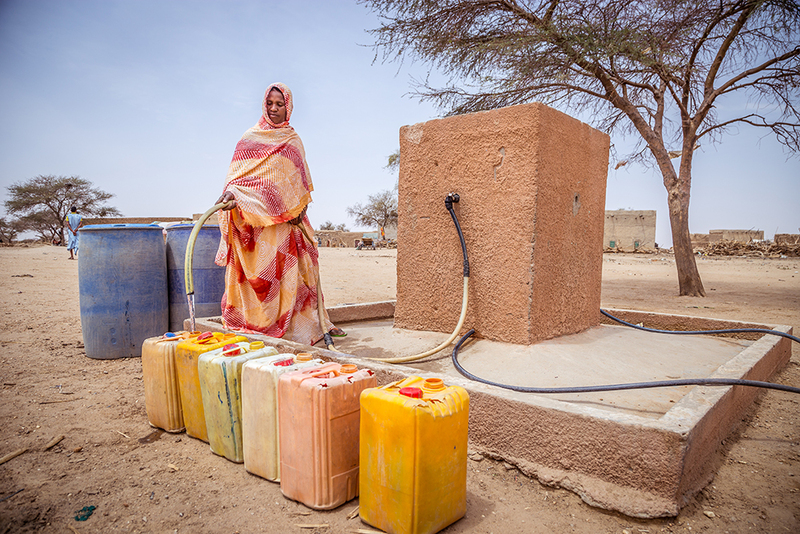 A woman pumping water in Bassikounou, at the Mauritanian-Malian border. Photo: IOM/Geoffrey Reynard. Baghdad – Iraq is at a critical juncture, emerging from a brutal conflict with ISIL and a long history of internal conflict, which has resulted in massive displacement and a setback in the country’s economic and social development. 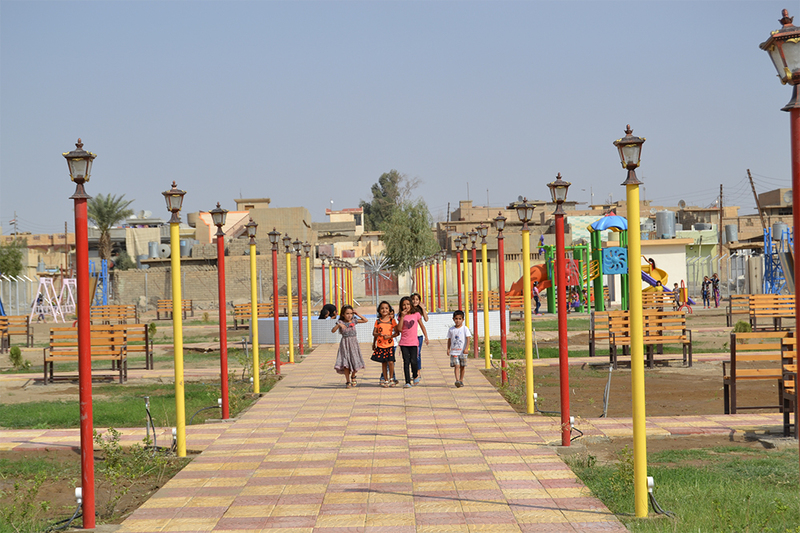 Today, Iraq grapples with the cumulative effects of past conflicts on its development, which has left the country vulnerable to the recurrence of conflict. Beira – The streets of this busy port city are returning to life as Mozambique approaches the one-month anniversary of Cyclone Idai’s March 14 landfall, while the search for survivors continues in neighbouring Zimbabwe. The challenge now is shifting to the outlying countryside, especially the Buzi River districts southwest of Beira, which largely were accessible only by helicopter until little over a week ago. It remains unknown how extensive the damage to housing has been in the region—and how many deaths still have gone unreported since March 14. 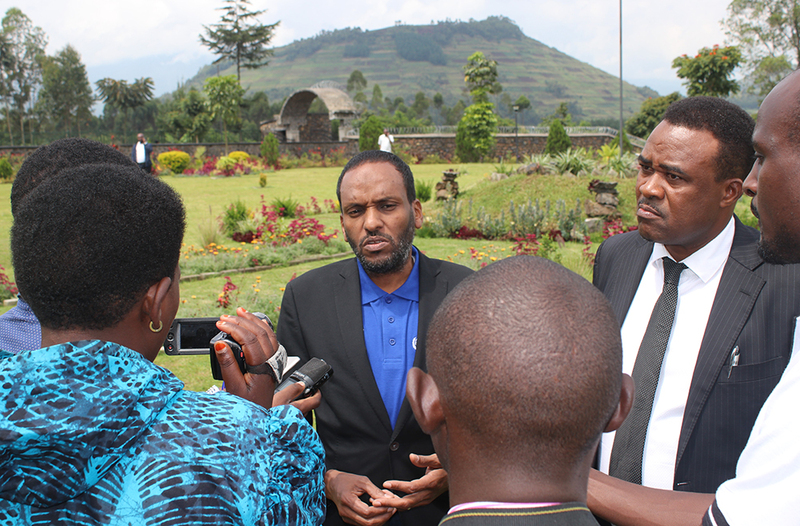 The International Organization for Migration (IOM) will begin sending assessment teams out into Buzi this week. Precise destinations are still being planned, but searchers can expect four-to-five-hour drives on mostly dirt roads, and to be staying several days at a time in rural villages. IOM’s Displacement Tracking Matrix (DTM) teams also have been working through the forested areas of Manica and Macate provinces assessing needs of internally displaced people living in dozens of temporary shelter locations. The death toll in Mozambique from the natural disaster was set Monday at 602 individuals. Some 2,772 cases of cholera have been reported, with six cholera deaths reported. In Manicaland, Zimbabwe, IOM’s Director of Operations and Emergencies, Mohammed Abdiker, joined Regional Director for Southern Africa Charles Kwenin and IOM Zimbabwe Chief of Mission Mario Lito Malanca on a visit last week (4 April) to the Chimanimani and Chipinge districts to assess needs and challenges faced by those communities affected by Cyclone Idai. Flooding affected 270 000 persons with an estimated 21 000 persons displaced in Chipinge and Chimanimani districts. 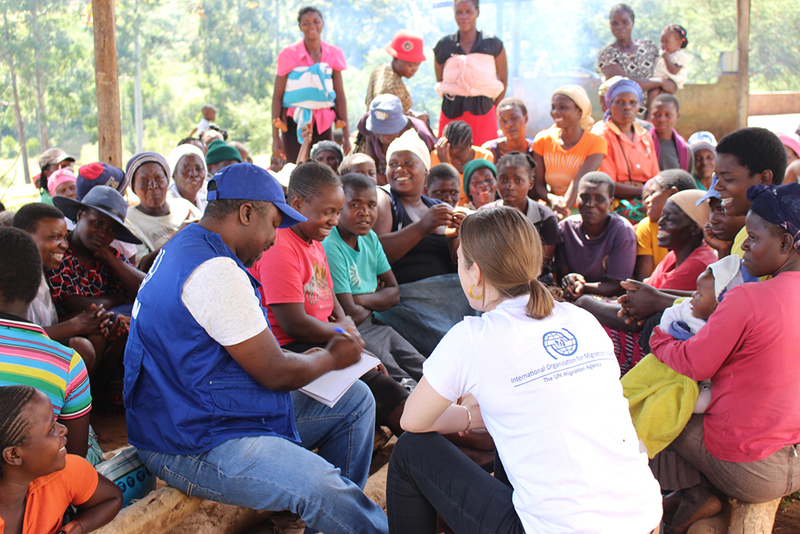 While visiting Kopa and Ngangu, two communities of Chimanimani where many displacements took place, the IOM team learned more than 77 households were reduced to rubble and that survivors still struggling find at least 305 missing people. In response to the crisis in Zimbabwe, IOM has launched an appeal (LINK) to the international community for USD 7.2 million to enable the Organization to provide multi-sectorial humanitarian assistance to 90,000 individuals across the following sectors; Shelter and -food Items (NFI), Camp Coordination and Camp Management (CCCM), Health, Protection, Displacement Tracking, Mental Health and Psychosocial Support (MHPSS) and Early Recovery. 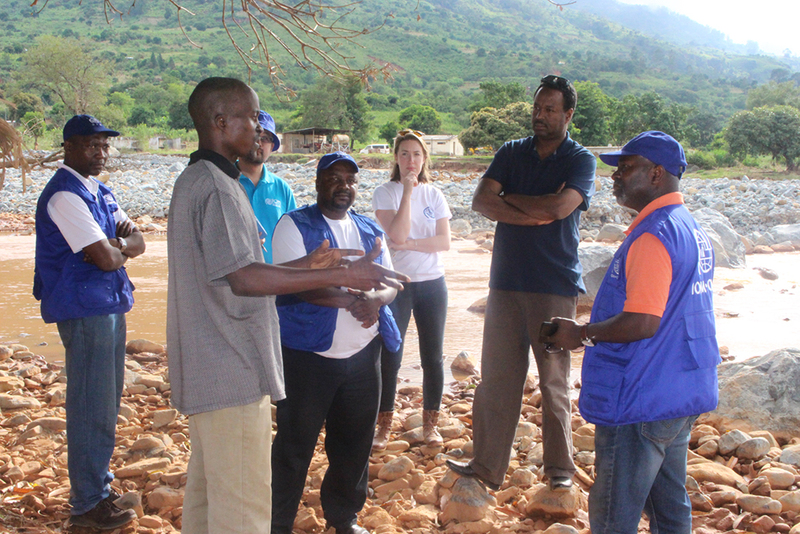 IOM’s Director of Operations and Emergencies, Mohammed Abdiker (2nd from r) and Regional Director for Southern Africa, Charles Kwenin (right) visit the Cyclone affected Chimanimani and Chipinge districts in Zimbabwe.